There are several reasons a supply curve might shift to the left or the right. In our example, a new technology would allow producers to produce chocolate bars at a lower cost, so they would be willing to produce and sell more bars. This would shift the supply curve to the right because the quantity of chocolate bars supplied would be greater at each given price. Click on each tab below to learn about the other factors that can shift the supply curve. As you consider each example, imagine that the price of chocolate bars remains constant but that the noted factor causes the market to change. The prices of resources used to make goods and produce services often change. For example, chocolate is made from the seed of the cacao tree. If cacao seed prices increased, Chuck's cost of producing chocolate bars would increase as well. This higher cost of production would cause Chuck to produce and sell fewer chocolate bars at every possible price, shifting the supply curve to the left. Let's say that before the supply curve shifted to the left, Chuck supplied 300 chocolate bars at $1.20 per bar but then supplied 200 chocolate bars at that same price. This decrease in the quantity supplied would hold for every possible price along the supply curve. Generally speaking, improvements in technology will lower production costs. For example, imagine Chuck invests in a new machine that wraps candy bars faster and uses fewer packaging materials. He would then be able to offer more chocolate bars to the market at each possible price. As other firms adopted the new technology and provided more bars at each possible price, the supply of chocolate bars would increase, shifting the supply curve to the right. Let's say that before the supply curve shifted to the right, Chuck supplied 300 chocolate bars at a price of $1.20 per bar (S1) but he now supplies 400 chocolate bars at that same price (S2). This increase in the quantity supplied would hold for every price along Chuck's supply curve. 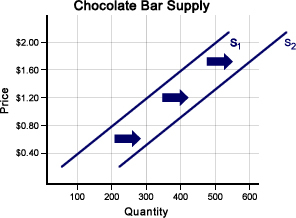 The supply curve for the entire chocolate bar industry is the sum of the supply curves of all individual chocolate bar producers. So, more producers in a given market will increase the supply of the good they produce. For example, if more firms start producing chocolate bars, there would be more chocolate bars available at each possible price. The market supply of chocolate bars would increase, shifting the supply curve to the right. Government policies, such as taxes, subsidies, and regulations, all affect the cost of producing goods and services and—as a result—firms' production decisions. For example, imagine the government taxed every chocolate bar that firms make; the result would be higher production costs. Faced with higher production costs, Chuck would produce fewer chocolate bars at each possible price. Other chocolate bar producers would likely do the same, shifting the supply curve to the left. On the other hand, if the government were to subsidize chocolate production, the result would be lower production costs. A subsidy is a government payment that supports a business or a market. In this case, a government payment to the chocolate producer would lower the overall cost of producing chocolate bars. Lower production costs would cause chocolate bar producers to increase the quantity of chocolate bars produced at each possible price. The supply of chocolate bars would increase, shifting the supply curve to the right. If firms expect prices to change, their behavior today will likely change. For example, if chocolate bar prices were expected to increase in the near future, chocolate bar producers might store much of their current production of chocolate bars to take advantage of the higher future price. This would reduce the chocolate bar supply for the short term. So, the expectation that prices will rise in the future would cause the supply to decrease today, shifting the supply curve to the left. On the other hand, if chocolate bar prices were expected to decrease in the near future, chocolate bar producers would try to take advantage of the current price by selling any extra supply they might have in inventory. This would increase the supply for the short term. So, the expectation that prices will fall in the future would cause the supply to increase today, shifting the supply curve to the right. If firms produce more than one good or service, a change in the price of one can affect the supply of another. Say the Chuck's Chocolates company also produces caramel candies. If the price of caramel candies were to increase, Chuck might shift some of his production from chocolate bars to caramel candies, decreasing the supply of chocolate bars and shifting the chocolate bar supply curve to the left.